Apparently, Manchester City superstar and greatest midfielder currently doing it Yaya Touré is unhappy with his club. Why, you might wonder, when they just won the Premier League in exciting fashion, featuring him as their best player? Because the team didn't celebrate his birthday. Let's focus on the funny bits first, before getting real. 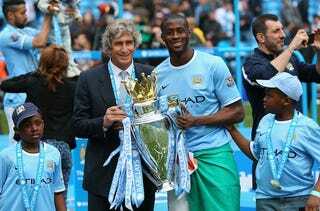 City won the title on May 11th, two days before Yaya's birthday. After the championship celebrations, the whole club made their way to Abu Dhabi for a friendly against Al Ain on May 15th. At no point did the club's leadership ever mention that ever so special 31st birthday. None of them shook his hand on his birthday. It's really sick…. He got a cake but when it was Roberto Carlos's birthday, the president of Anzhi [Makhachkala] gave him a Bugatti. I don't expect City to present Yaya with a Bugatti, we only asked that they shook his hand and said 'we congratulate you'. It is the minimum they must do when it is his birthday and the squad is all together…. Of course Yaya is upset about this. If this happened to you as a journalist in the BBC and nobody shakes your hand, you will say bye-bye and go to work for somebody else. It is normal. Man, those Anzhi people really know how to make a guy feel valued, ya know? And it's not like Yaya was trying to channel his inner Future, he just wanted a simple handshake. Is that too much to ask? While the ridiculousness of Touré's agent's claims might have had you expecting a public rebuke by the player himself, on Twitter today Yaya confirmed his agent's position. Now, let's talk about what's really going on here. I don't believe for one second Yaya is threatening to leave because of some birthday snub. Nor do I think there is Sunderland's chance for the Premier League title that Man City let their talisman walk. Yaya is looking for more love, but of the economic variety. The agent insists it's not about the money, but it is definitely about the money. Yaya's 20 goals were the most in any of the top five European leagues for a midfielder, and would be an impressive tally for even a star striker. Over the past three or four years, Touré has proven that there is no other central midfielder in the world who can do what he does. He is flat out amazing. So while he already received an improved contract last season, there's no reason, from his perspective, that he shouldn't get another one this year. Cristiano Ronaldo and Lionel Messi basically sign new contracts every other year to become the highest paid player in the world, so Yaya's request isn't at all unsurprising. It's better to come off as ridiculous than greedy, though, which is how we get situations like this. Sometimes it's a foreign nation's food that a player complains about. Other times a purportedly homesick Brazilian will request a transfer from Spain to Italy. It's just how things go. However, on the off chance Yaya is serious about wanting a move, I'm sure my boys in Barcelona would throw him a monster of a welcome back party.